Melbourne Football Club was formed in 1859 and is the oldest Australian Rules Football club in Australia. It has a close relationship with the MCG Cricket/football ground and a proud history. Melbourne was a foundation member of the VFA and then again was a founding member of the VFL when it was formed in1897. Melbourne had not won a VFL/AFL premiership since 1964, meaning that club success is out of the living memory of most supporters but those that look at the clubs history will see periods of greatness. Melbourne won premierships in 1900 and 1926. Ivor Warne-Smith, winner of two Brownlow medals(1926,28) being an early champion. Leading into the Second World War, Melbourne won a string of three premierships in a row (1939, 1940 and 1941) under coach Frank ‘Checker’ Hughes and captain Allan La Fontaine. A sixth premiership in 1948 was won after a draw against Essendon and then a victory at the Grand Final replay a week later. Players such as Norm Smith, Denis Cordner, Don Cordner and Jack Mueller were part of the forties line-up. 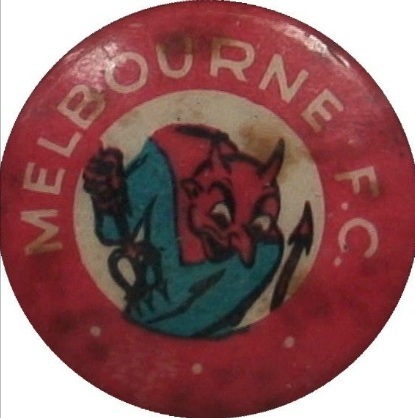 The 10 years from 1955 to 1954 were a period of great dominance for the club, finalists every year and with six premierships (1955, 1956, 1957, 1959, 1960 and 1964). With Norm Smith coaching and Ron Barassi a star player, the club found a succession a great players and on-field success. Recent history has been less kind to Melbourne, with a lack of success, but when in the time that Charles Boyles was taking photos, Melbourne had a successful side.